The reflection of light from stars has been little studied by astronomers. In our study of the polarization of the light from the binary system Spica, we show that the dominant source of polarization is light reflected from one star off its companion and vice versa. Stars are generally poor reflectors of light but the reflected light is very highly polarized and therefore easily observable. Reflected light provides a new tool for studying binary stars. In 2014 we commissioned a new astronomical polarimeter on the 3.9m Anglo-Australian Telescope, the High Precision Polarimetric Instrument (HIPPI), which was capable of measuring stellar polarization to a few parts per million, substantially higher than the precision of most previous instruments. One of the first projects we carried out with it was a survey of the polarization of all the bright nearby stars in the southern hemisphere (Cotton et al., 2016, MNRAS, 455, 1607). One of the results of the survey was the detection of intrinsic polarization in almost all of the B-type stars observed. In one respect polarization in such hot stars is not surprising. Chandrasekhar had shown more than 70 years ago that scattering from electrons would lead to polarization in the atmosphere of a hot star. However, in a spherically symmetric star the polarization would average to zero. Only if the spherical symmetry was broken in some way would a net polarization result. At the time it seemed unlikely that most B-type stars would be sufficiently non-spherical to account for the polarization we were seeing. One symmetry-breaking mechanism that could account for polarization was soon found. We determined that Regulus was polarized due to the distortion arising from its rapid rotation (Cotton et al., 2017, Nature Astronomy, 1, 690). Regulus is spinning at 96.5% of its critical velocity for breakup. We have since found similar polarization effects in a number of other bright early type stars. Rapid rotation is a fairly common feature of such stars. However, it is not sufficient to explain all of the polarization we see in B-type stars. Another polarized object found in our survey was Spica. Previous observations of Spica had shown low polarization and no indication of variability, but with the higher precision of HIPPI it was clear that Spica was both polarized and that the polarization was variable. Spica is a binary system containing two B-type stars with an orbital period of just over 4 days and we suspected that the variation would correlate with the orbital cycle. However, with the limited number of nights we had on the Anglo-Australian Telescope this was difficult to confirm. In 2016 we built a new miniature version of our polarimeter (Mini-HIPPI) and installed it on the small Celestron-14 telescope in our observatory on the UNSW campus in Sydney. While not quite as accurate as the larger version this new instrument enabled us to obtain much more extensive observations of Spica which soon confirmed the orbital variations. 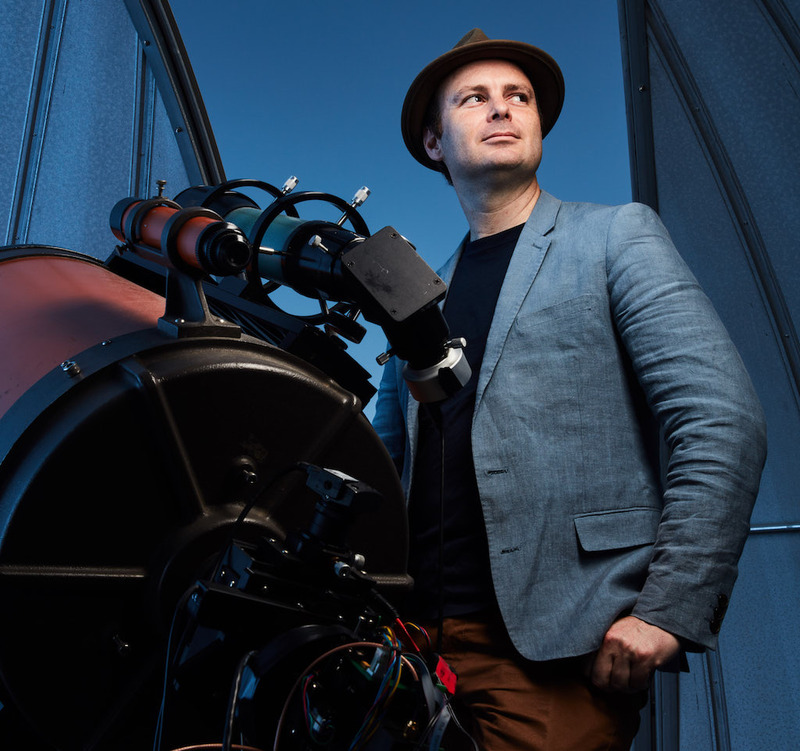 The image below shows Daniel Cotton (who took most of these observations) with the UNSW telescope. In 2018 we were able to further extend the observations using our new HIPPI-2 instrument which was used both on the AAT and on the 60 cm telescope at Western Sydney University's Penrith Observatory. The results showed the polarization of Spica varying with orbital phase and showing two peaks and troughs in each orbital cycle. Polarization variations of this form had been seen in a number of early type binaries in observations going back to the 1970's. It had usually been interpreted as due to scattering from circumstellar material resulting from mass transfer between the two stars. However, in two cases it had been suggested that reflected light from the stars could be responsible, although this was not confirmed by detailed modelling. For Spica the reflected light model was attractive since Spica is not an interacting binary. Both components of Spica are well within their Roche lobes and mass transfer should not be significant. So we searched the astronomical literature for previous work on the reflection of light from stellar atmospheres and came up with almost nothing (although the issue is confused by something called the "reflection effect" in eclipsing binary systems, which turns out to be not reflection but actually heating of one star by the other). So we had to start from scratch and develop our own modelling methods for the reflection of light and the polarization of that light that are described in our paper. When we did so we found that the polarization amplitude observed in Spica was exactly that predicted. Furthermore the orbital orientation on the sky (position angle of the line of nodes) agreed with that determined by observations with the intensity interferometer in the 1960s. We now think that reflected light is the dominant polarization mechanism in early type binary systems, and probably accounts for much of the polarization previously attributed to circumstellar material. Because binary systems, as well as rapid rotation, are very common among early type stars we can begin to see why intrinsic polarization is seen so often in B-type stars. Polarization provides a tool that can be used to detect previously unrecognized binaries, and to determine inclinations and hence masses for non-eclipsing binaries.